Anansi the Spider is one of the great folk heroes of the world. He is a rogue, a mischief maker, and a wise, lovable creature who triumphs over larger foes.In this traditional Ashanti tale, Anansi sets out on a long, difficult journey. Threatened by Fish and Falcon, he is saved from terrible fates by his sons. But which of his sons should Anansi reward? Calling upon Nyame, the God of All Things, Anansi solves his predicament in a touching and highly resourceful fashion.In adapting this popular folktale, Gerald McDermott merges the old with the new, combining bold, rich color with traditional African design motifs and authentic Ashanti language rhythms. 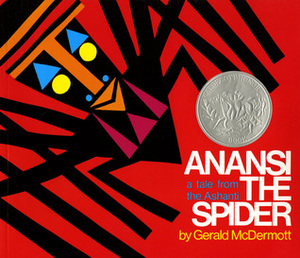 Anansi the Spider is a 1973 Caldecott Honor Book. Why, yes, it's important to get the kids digging the story of Anansi, so that they can appreciate Gaiman later on. I liked the strong graphic images and the really brief story had a distinctive voice.